Olivia Moultrie is such a talented soccer player that this year she not only competed in the U.S. Soccer Development Academy, the nation’s highest level of youth soccer, but she was also the first girl to ever play for a boys team. Two years ago she accepted a scholarship offer from college powerhouse North Carolina. That came not long after she began being homeschooled to allow for additional time to focus on soccer, including trips to train in the youth academies of prestigious European clubs. And now she is a pro. And yes, let’s repeat: She’s 13 and would be in the seventh grade. Moultrie was rolled out as a Nike endorser this week by appearing (briefly) in a commercial that ran during the Academy Awards and (prominently) in a web-based one that focuses on her. Nike, no doubt, hopes the best way to sell to the swarming masses of young female soccer players in this country is to do it through a young female soccer player. It’s likely smart business. The commercial even looks like a social media post, the preferred medium for communication among that age group and one in which Moultrie already boasts nearly 100,000 Instagram followers. By signing with Nike, Moultrie is done with North Carolina due to NCAA rules. The same is true with high school soccer or even traditional club soccer. 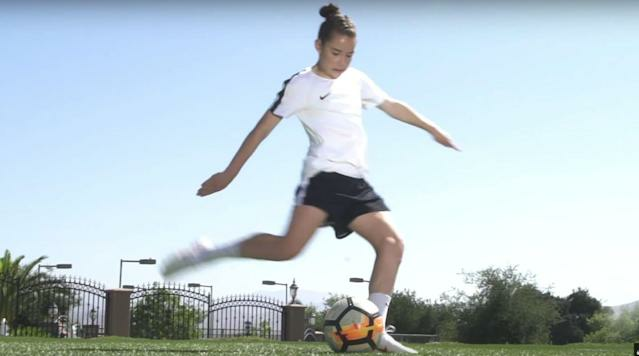 If Moultrie’s goal was to change the way girl’s soccer in America is viewed — and she suggests some of that in her commercial — then she and her parents and agents at Wasserman have certainly managed that. She’s not just a girl who can play with the boys (at least for now), but one who is following the boys’ route to development as an athlete. That’s impactful whether she becomes a great player or not. There is, and will no doubt continue to be, hand-wringing over this. As good as she is at 13, there are no guarantees that she will be elite in her 20s when she — and all the other girls — are done growing and developing. Soccer is also not a blunt-force sport. Speed and technical skill can allow a player to dominate at young ages, but creativity and tactical thinking are critical at the sport’s top levels. Maybe she has that. Maybe she doesn’t. The Oregonian is reporting Moultrie will move from her home in Santa Clarita, California, and join the developmental academy of the Portland Thorns of the National Women’s Soccer League, despite league rules prohibiting players under 18 from competing on the top team. She is eligible to play for various U.S. soccer national teams. She was on the Under 15 team last fall, but they play limited schedules. So why do it? Why kick away the college scholarship or the years of orange wedges and state championships with her friends? If she were a singing prodigy and moved to Nashville, no one would blink. If she were an actress and headed to Hollywood, it would be understood. As an athlete, if she were a tennis player or a gymnast, then it would all make sense. She may have lost her scholarship to North Carolina, but her agent told the New York Times that Nike is paying her more than that. Her scholarship is projected to be approaching $300,000 in cost of attendance for an out-of-state student in the Class of 2028, but it’s not like Moultrie can’t still go to college on her own dime. For all the angst this decision is causing, Moultrie isn’t really rewriting the rules here, she’s just following the established one — the one for elite male soccer players, especially in the rest of the world. At 13, Lionel Messi moved all the way from Argentina to Spain to join the famed youth academy of Barcelona FC. And that was after he’d spent years in the academy of a local pro team in his hometown of Rosario. The top young American player, 20-year-old Christian Pulisic of German Bundesliga leader Borussia Dortmund now and Premier League giant Chelsea come this summer, didn’t worry about winning high school games or talking to college recruiters in Pennsylvania, where he lived as a teen. He headed to Germany at 16. In America, team sports are viewed through the prism of football and basketball, where the high school and/or college model has proven adept at creating the best in the sport. If it was good enough for Tom Brady and LeBron James, then what’s the problem? That includes women’s team sports, too, particularly the powerhouse U.S. Women’s National Team, where the elite came through the prep and then the collegiate system. Mia Hamm went to Carolina. Carli Lloyd played for Rutgers. Alex Morgan was famously still playing rec at age 13. The sport may be on the cusp of a new era though. Mallory Pugh, 20, is America’s top young talent. She chose to play pro in the NWSL rather than collegiately at UCLA. Moultrie could be ushering in the new normal, turning the high school and college route on its ear, but also, in a way, exposing soccer’s pay-for-play travel teams and leagues as inadequate and often ineffective. Almost everyone agrees travel soccer is deeply flawed. Now here’s a kid seeking an alternative. Is she good enough? Will it work? Are her parents cheating her out of what most Americans would consider not just a normal childhood, but a pretty great one as a celebrated high school and college athlete? Who knows? The family gets to make the decision. That’s the American way. Besides, maybe staying the traditional course would have been the wrong one. In her commercial, Moultrie states that she likes to prove people wrong and notes she did that by playing with academy-level boys. In the long run, that’s nothing though. Whether she becomes a star or not, here’s a girl unapologetically pursuing soccer full-throttle, just like the best boys of the world. She’s acting like Lionel Messi, not Alex Morgan. That’s the real impact here. That’s the real trail getting blazed.